As part of the Globus family of brands, Avalon Waterways is backed by 80-plus years of travel expertise offering river cruising & small-ship cruising. Offering the newest, quietest, and most spacious river cruise and small-ship cruise ships, state-of-the-art resort-style amenities, and incomparable service, Avalon lets you cruise Europe, Egypt, China, and the Galápagos Islands in a world-class way. These river cruise & small-ship cruise ships allow see the world's most beautiful landscapes-even from the privacy of your luxuriously appointed stateroom featuring modern amenities. That's because on an Avalon river cruise ship all staterooms enjoy an outside location and are designed to enhance your river cruise experience. 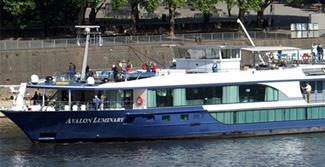 Fellow Passengers – Avalon Waterways’ guests tend to be older, wealthier and more seasoned travelers. Although their guests are from all parts of the world, a typical guest is from an English-speaking country. Guests on their European cruises are predominantly North American and Australian, while the South American and China cruises also get a lot of travellers from the UK. 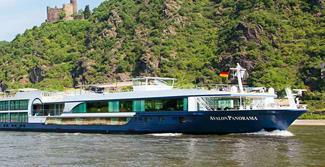 With an Avalon Waterways cruise you'll get to thoroughly explore the towns, villages and exotic scenery along the way. China The longest river in Asia and the third longest in the world at more than 3,915 miles (6,300 km), the Yangtze flows from the Tibetan Plateau in the west to the East China Sea. Travel through the impressive Three Gorges (Qutang, Wuxia, and Xiling) and view the immense dam, China's largest construction project since the Great Wall. Qutang is the shortest and most dramatic gorge, where you can nearly touch the perpendicular mountains that rise from the river banks like walls. Egypt Journey along the lifeline of Egyptian civilization, sightseeing ancient temples, tombs, local villages, and farms. Located in Africa's northeast, the Nile is the longest river in the world! Measuring 4,160 miles (6,955 km), the river flows north from Lake Victoria through Uganda, Sudan, and Egypt, passing rainforests, mountains, savannas, swamps, and desert landscapes before culminating in the fertile Nile Delta and draining into the Mediterranean Sea. 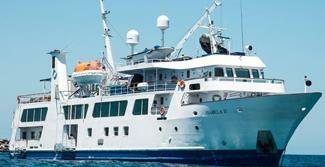 Galapagos Islands Consisting of 13 large and hundreds of small islands in the Pacific Ocean off the western coast of South America, the Galápagos Islands are home to some of the world’s most fascinating animal life. Encounter giant tortoises, penguins, sea lions, lizards, and a whole host of diverse bird species. As you explore these remarkable volcanic isles firsthand, you’ll discover the wildlife that inspired Charles Darwin. Review Title : One of the excellent Trip I had in my life. Isabela II has an expeditionary approach that allows you to authentically discover and explore the natural wonders of The Galapagos region. It is built to luxurious standards and features an elegant yet relaxed atmosphere, allowing guests to enjoy all that the Galápagos is famous for intimate contact with the wildlife! Delve into this unique world with the Isabela II's crew and expert Naturalists, who share their passion for nature and conservation of this mysterious part of the world. The Avalon continues its outstanding commitment to comfortable luxury and excellence with the Envision. Avalon Envision's features are two decks of Panorama Suites. These 200-square-foot cabins feature wall-to-wall French balconies that open up to create what Avalon likes to call a, "wall-to-wall panoramic balcony." The Avalon Luminary, coming in 2010, is one of the latest additions to the Avalon Waterways river cruising fleet, with a design that reflects the uniqueness of the area, and which differentiates her from the other Avalon river cruise vessels. 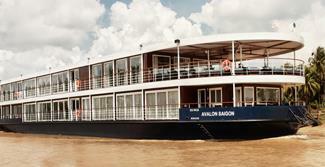 The new Avalon ship cruising on the Mekong is specifically designed to offer an intimate experience, so you can truly immerse yourself in the culture, people, and sights along the Mekong River. Built by traditional craftsmen, the ship mixes modern comforts with the colonial charm associated with Vietnam and Cambodia. 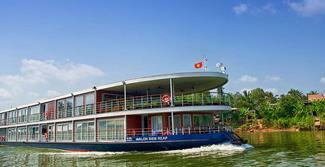 The design also allows her to be the only ship sailing all the way from Ho Chi Minh City to Siem Reap (or vice versa). A brand new kind of ship, the Avalon Panorama sets sail in 2011, taking inspired design to a whole new level. A unique "Suite Ship," the Avalon Panorama is the first of its kind in the industry - with two full decks of suites featuring a Wall-to-Wall Panoramic Window that transforms the living space into a unique Open-Air Balcony.